Few words elicit a more immediate and visceral response than the word “test.” That’s because, in most educational settings, we have testing all wrong. Often, tests are s a primary measure of success and in some instances can have lifelong ramifications—like the ACT and SAT—on one’s future. The same holds true for training evaluation. We often focus on summative evaluation used after training ends to gauge success. In contrast, formative assessment allows trainers to collect information and make immediate changes to address learning gaps before training ends. Formative assessment refers to a variety of tools all pursuing the same goal: to “help form, or shape learning” (Trumbull and Lash, 2013, p. 2). The purpose of conducting a formative assessment is to gather information at one or more points during training to help both the trainer and trainee improve learning outcomes. Rather than waiting until the end to learn whether training was or was not successful, formative assessment allows both the trainer and trainee to make adjustments as needed to facilitate a successful outcome. The essential key to formative assessment lies not only in collecting information about learning but using it to guide training. Trainers may succeed in gathering evidence about learning and may accurately interpret the evidence to identify what knowledge is lacking, yet may not be able to identify, target, and carry out specific instructional steps to close the learning gaps (Heritage, et al., 2009; Herman et al., 2006). That’s because the use of formative assessment is case specific and depends on the characteristics of the instructor, the learner, the delivery mode, and the nature of the learning gap. General strategies for additional practice, worked samples, varying delivery (audio or video rather than text), peer learning, teach back, metacognitive strategies, or more time on task can close the gap. When formative assessment works—when learning gaps are identified early in training and addressed—the results benefit both the learner and the trainer and can lead to higher levels of satisfaction, learning, and transfer. 1. How would formative assessment tools differ from those used for summative assessment? How might they be the same? 2. Have you used formative assessment in training? If so, can you share an example, if not can you tell us why you haven’t used it? Herman, J. L., Osmundson, E., Ayala, C., Schneider, S., & Timms, M. (2006). The nature and impact of teachers’ formative assessment practices. CRESST Report 703. Los Angeles: UCLA National Center for Research on Evaluation, Standards, and Student Testing. Heritage, M., Kim, J., Vendlinski, T., & Herman, J. L. (2009). From evidence to action: A seamless process of formative assessment? Educational Measurement: Issues and Practice, 28(3), 24-31. Trumbull, E., & Lash, A. (2013). Understanding Formative Assessment: Insights from Learning Theory and Measurement Theory. Formative and summative assessment have their different importance. Formative assessment gives an opportunity for training from which the desired outcomes can be achieved. Whereas, Summative assessment gives an opportunity for doing better in the future trainings. In my opinion, Summative assessment is better compared to Formative assessment as there are many people and time and size of the group need to be taken into consideration. In my past experience, I have used both formative and summative assessment. Formative assessment used to be a bit challenging for me in the beginning but as I started to gain my knowledge, I had to build appropriate skills through the training. Summative assessment was a bit difficult as I was considering the minor improvements to be made. But, in the end, it was a great implementation of an effective new training. How Formative assessment tools differ from those use of summative assessment is by the formative refers to a wide variety of methods that teachers use to conduct in process and evaluation of student comprehension, learning needs, and academic progress during a lesson, unit or course. Summative assessment refers to the assessment of participants where the focus is on the outcome of a program. This contrast with formative. they may be the same because they both use a process through evaluations and learning styles. I think that it is huge for an instructor to be able to style flex to their audience and be able to identify gaps via body movements, etc. Also to recognize the learning style of their audience to achieve success on any test or assessment. Formative assessments are beneficial tools that I use often in my work place. The objective nature and systematic approach is an invaluable tool that allows for a simple understanding of the assessment. It also allows for the gap to be bridged for unidentified skills not used yet. I think in change process formative assessments can be beneficial by allowing a company know if the desired change has occurred. I think that this is a great way to help both the trainer and the trainee be creative with change.I think the formative assessment helps understand different procedures and help gain understanding. Formative for learning needs and Summative for learning at the end of the course.. Both require some sort of learning during the course training. What is it that you need and did retain what was being taught. In my collections training class, I used an assessment form to gauge where the class was at as far as their knowledge of the industry so that I wouldn’t repeat it and keep the class engaged. 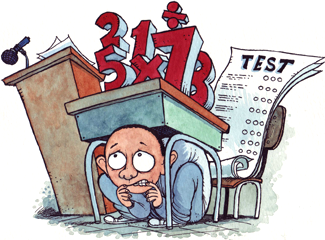 I have suffered from test anxiety my entire educational experience. I am the type of person who freezes up on a test and then remembers all the answers after I have turned it in. Therefore, I agree that formative assessments are a great measurement for determining the learning gaps. I have to admit that my most effective training experiences have been most successful when the trainee used formative assessments vs test to identify the level of comprehension on the subject. I plan to become an online instructor and I will definitely use formative assessments to gauge my students learning gaps and abilities. As a person who fears to take the test and can relate to the cartoon illustration in this article, I believe both assessments should be used to evaluate the learners. However, the tools may differ. Formative assessment is to monitor the learner’s progress and makes any corrective measures on the way. Whereas summative assessment is to evaluate the learner at the conclusion of the training session. I find the use of Formative Assessment tools to be crucial when ensuring the success of participants and the trainer. Although test can seem daunting to some, there is room to get creative in the way practitioners formally capture how learner retain information or apply knowledge while in the process. This allows for training sessions or environments to stay fluid so that learners feel less pressure to meet certain standard or provide specific results. Both Formative and Summative assessments aim to provide clear data around how the training program meets the desired objective set forth in the planning stages. They differ simply because of the implementation process and time at which practitioners choose to integrate. The tools that surface from both may look unique as the formative does not capture all of what learners have experienced while summative is all inclusive. I haven’t used either assessment strategy due to not being fully involved in programs that would require the effort. I had a professor in undergrad who would call tests ‘celebrations’. He says that students always froze when thinking about tests so he called the celebrations so that we could get excited about celebrating what we have learned thus far in the class. Thinking back on it it was a pretty cool concept. Formative and summative assessment both have equal value when trying to teach something new. However formative assessment is a breath of fresh air since we are all so used to summative assessments. When I think of formative assessments I think of the instructor and student having a mutual checking-in — ensuring that concepts presented are being understood. Weekly quizzes are both summative and formative however discussion boards on a topic or concept is formative. A balance of the two is needed when instructors/trainers are considering improvements. Formative and summative assessment tools both have value. Formative assessment allows for adapting a training as it is being conducted to ensure it is achieving its desired outcome. Summation assessment allows for improvement of future trainings and evaluations. Summation assessment is easy to incorporate into trainings at the end with surveys though formative assessment is not so easily incorporated at times and has other constraints including time and size of the training group. I have used both formative and summative assessment in my work in the past. Formative assessment must be more fluid and mendable in real-time, which there is a bit of finesse involved with this. Truly experienced trainers and presenters excel at this. I slowly had to build my skills through repeated experiences conducting trainings. Summative assessments I always added to the end of my trainings. I was always tweaking and trying to make minor improvements. I remember these assessment tools were invaluable to redesigning a training program entirely when I started my old job. The old trainings were missing their mark in every aspect and required a complete redesign. The feedback from the failures of the old training allowed for the design and implementation of a very comprehensive and effective new training. Have you used formative assessment in training? If so, can you share an example, if not can you tell us why you haven’t used it? I haven’t used it in an actual training but have planned for it while taking classes for TD. Formative assessment is such a useful tool, it allows you to fix problems in your program right away before the learner leaves you. I’ve did check for understandings through training by simply asking questions, and giving thumbs up. I’ve also used role play and brain dumps, where the learner write down everything they know about a giving topic. The formative assessment tools are design is a proactive approach to evaluating the participants, reactions, what is learned, and how it influence behaviors subsequently transferred into their job duties and responsibilities in the workplace. Summative assessments will evaluate the same, however its design is really a reactive approach. Since it is administered post training it has tremendous value for modifying training programs that future participants will attend (content, facilitation, learning environment, etc.). I use formative assessments throughout my training programs. They are strategically inserted between module topics and are varied in style. It reinforces what the participant learns and also evaluates if the learning content or facilitation style should be modified for the remaining training portion. There are two formative assessment styles I’d like to share. The first one is if the module topic is learning a technology system, the formative assessment will in the form of a “scavenger hunt”. It’s an individual hands on exercise so the participant can tie what was learned in the demonstration and lecture and apply how to use the technology navigating throughout the technology to identify answers found in various links. Another formative assessment used is in the form of a group activity. If the module topic is preparing for a test, the formative assessment will be in the form of a game show (Jeopardy, Family Feud, Who Wants to be a Millionaire, etc.). Teams are formed and everyone has an opportunity to answer questions that will be on the actual test. It allows for immediate feedback on subjects that the facilitator needs to review with the entire group, defuses any anxiety participants may have leading up to the actual test, and allows participants to ask questions for clarification to help them prepare and study for the test. Thank you for sharing your experiences. This is great follow up to my post with concrete examples. Wonderful! Formative assessment helps with the understanding of assessment which also include diagnostic testing, which is among the range of formal and informal assessment procedures, conducting by teachers and learning activities to improve students attainment. Summative assessment refers to the assessment of participants where the focus is on the outcome of a program. This contrasts with formative which summarize the participants development at a natural. they both maybe the same because they dill with the participants of the program and the development. No I have not use any formative assessment in training yet. The only reason I have not use it yet because I have not did any recent training yet, however I plan on use some of these assessments.